View our diamond bracelets here. Diamond bracelets create a lasting impression. They are so special that they will be cherished by anyone for a lifetime. They can be used as a gift for a child to mark a momentous occasion and they are the perfect gift to express one's love to another. No matter what one's taste in jewelry is you will be able to find just the right diamond bracelets for them. There are diamond bracelets that are full of hundreds of diamonds. These are fabulous and worth thousands of dollars. If you can afford one of these fantastic diamond bracelets, your recipient will undoubtedly be impressed. If you cannot afford such extravagance, there are many, many bracelets out there that are just as beautiful and much more affordable. Charm bracelets are items that never seem to go out of style and diamond charm bracelets are growing in popularity. With the gift of a diamond charm bracelet you will be able to give the bracelet with only one or two charms already on it. The recipient can then collect more charms as she goes through life. By using the charms to represent different events in one's life, the bracelet can provide you with a trip down memory lane, all on your wrist. Diamond charm bracelets add that extra element to the physical beauty and meaningful gift of a charm bracelet. Diamond bracelets can sport a wide variety of charms. There are charms out there for any occasion. Even if you can not find a charm to suit your diamond bracelet, you may be able to build your own diamond bracelet. Heart charms make an excellent gift since hearts symbolize love. Having a diamond set into a heart charm is stunning especially when it is gracefully dangling from a gorgeous diamond bracelet. You have the flexiblity to create your own diamond bracelet by choosing the type of metal for the bracelet, the charms and the types of diamonds. There are endless possibilities when it comes to charm bracelets. 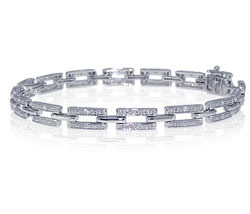 Just use your imagination and you will be able to find a diamond bracelet that will astonish your recipient.